Home » Nutrition » Healthy Eating » How to Enjoy Summer Flavors! Summer is finally here! Unfortunately, those tired summer recipes from last year are just not exciting anymore. Hot dogs, chips, and soda just aren’t exciting anymore, plus, they could use a nutritional re-boot. Check out these easy ideas for making summer fresh again. Avocado – Avocado is a fruit that is not sweet! Mash up avocados with lime juice, cilantro, and salsa to make a simple guacamole. Try having mixing chopped avocados with fresh mint and melon, grapefruit or berries, fresh mozzarella and peaches or nectarines. 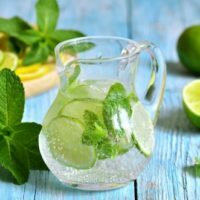 Citrus Mint – Add lemon wheels and mint leaves to a pitcher of water and put it in the refrigerator for 1-2 hours before drinking. Mint is easy to grow in a pot. Consider starting a little potted herb garden on a stoop, windowsill or porch. Strawberry Lime – Put 5-6 strawberries that have been cut in half and 2 limes cut into fours into a pitcher of water and refrigerate for 1-2 hours. Cucumber Cooler – Add cucumber slices to a pitcher of water and refrigerate for 1-2 hours before enjoying. Jicama – Jicama is a root veggie that tastes like a cross between an Asian pear and cucumber, just not as sweet. Peel the skin off and cut into strips. Squeeze fresh lime juice with chilli powder over it, or splash it with orange juice and cilantro. Eat by itself or in a jicama slaw or salad! It’s tasty dipped in hummus! Nopales – Nopales is a prickly pear cactus leaf that tastes like a bell pepper, but is a little slimy. Peel the thorns off, boil or grill them, and cut into strips or small pieces. Eat in tacos or in a salad. Tomatillo – Tomatillos are like little green tomatoes with husks, like corn. Green salsa is made from tomatillos. Mango – Mangos are a sweet, delicious fruit with thick skin and a huge seed in the center. Peel the skin and cut into strips. Sprinkle with lime and eat for dessert! They’re also delicious grilled in a raspberry sauce. I puree frozen raspberries and pour over the mango and grill them – it’s delicious. Check out this tasty and refreshing mango salsa. Comment on How to Enjoy Summer Flavors!